The current felt like the wind on a breezy day, and it was blowing me past the coral-covered sheer wall that disappeared over 60m (200ft) below me. Looking directly down, I noticed the color blue fading into slightly darker shades and finally into darkness, at the edge of how far I could see. 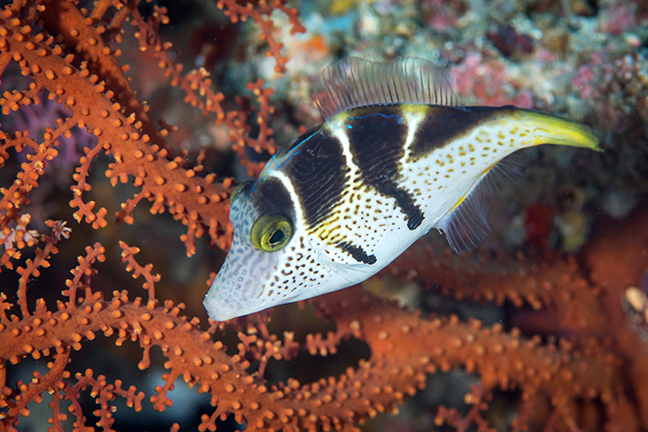 Black-saddled toby on reef, North Sulawesi, Indonesia. Photo by Brandi Mueller. While Thalassa Manado is located on the west coast of the northern peninsula of “Sulut,” the operation’s newest resort, Thalassa Lembeh, is located on Lembeh Island off the east coast of the peninsula. 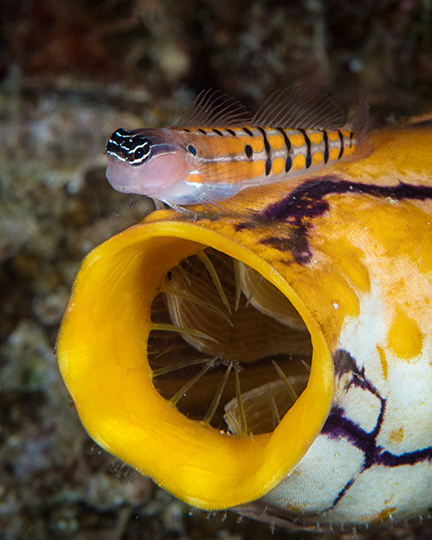 At Thalassa Lembeh, divers can enjoy muck diving at its best. A multi-resort stay at Thalassa is now possible in which you can dive Bunaken National Marine Park and Bangka Archipelago at Thalassa Manado as well as the incredible, rich muck diving in Lembeh Strait at Thalassa Lembeh. 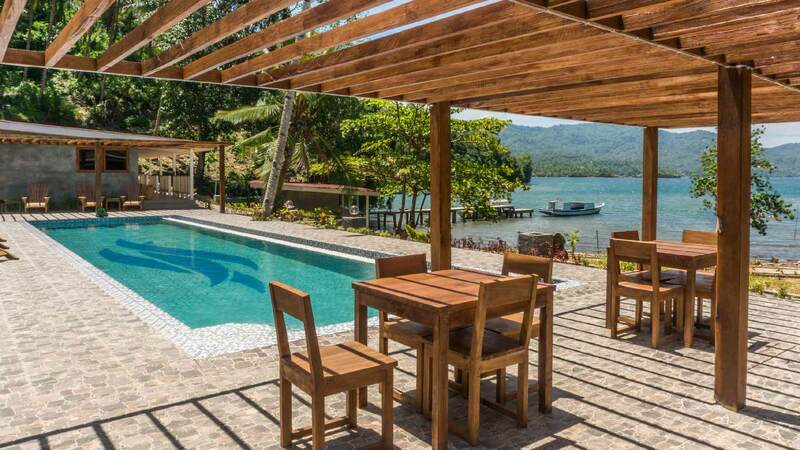 The new resort on a peaceful cove with beautiful views of Lembeh Strait has nine comfortable bungalows, each with its own private terrace overlooking the sea. There is a swimming pool for both dive courses and relaxation. Cappuccinos can be enjoyed at the Sabar Lounge and Santai Restaurant, led by Chef Arifin, offers delicious meals in the Minahas tradition. Between dives, guests can enjoy a traditional massage or go on one of the excursions offered by the resort. You can explore the lush, green island of Lembeh on guided hiking trips or get a glimpse of island life with a visit to the local village. To my right was a gorgeous wall of color. Pink and purple soft corals extended fully, reaching out into the current to feed on plankton passing by and numerous giant purple barrel sponges extending away from the wall. Looking to my left into the open water was more blue and thousands of fish. Butterflyfishes, including the largest congregation of pyramid butterflyfishes I have ever seen, fluttered about in the water column, seeming to move in sync with one another. Turtles clearly dominated this space. I could not go more than a few minutes without seeing one sleeping in a crevasse or on a comfy-looking sponge. When I looked out into the mass of small fish off the wall, sea turtle silhouettes could be seen moving toward the surface for a breath of air. The current continued to carry me along the wall. Suddenly, the wall turned a corner inward, and as I drifted around the slight bend in the reef, the current all but stopped. Not moving and looking around, it felt like I was flying, and the desire to do a swan dive down into the abyss below me was tempting. It was one of those “wow” moments where I remembered I was so lucky to be here, underwater, surrounded by this beauty. As if on cue, a sea turtle emerged out of the blue, swimming right towards me, then over my head, and slowly settled on the reef for a nap. 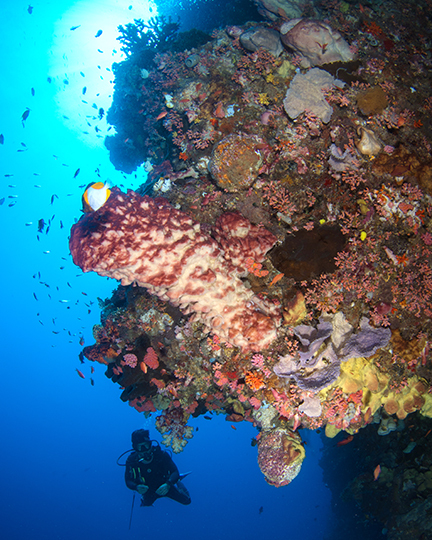 North Sulawesi is one of those exotic destinations on every diver's list. 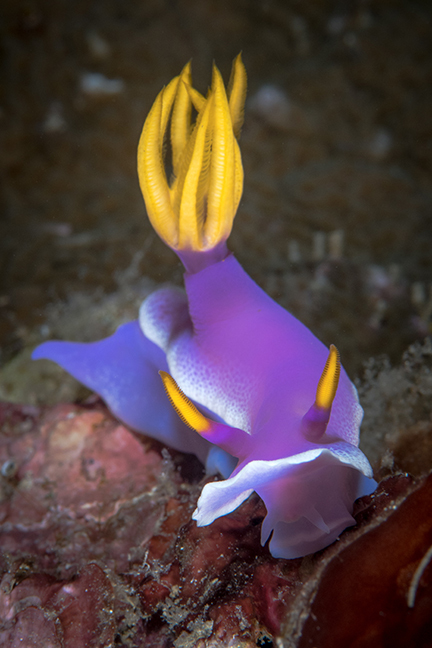 When someone asks me about the diving in the region, I find myself going on and on about the wonders of Lembeh Strait like a love-sick teenager pining for a high school crush. 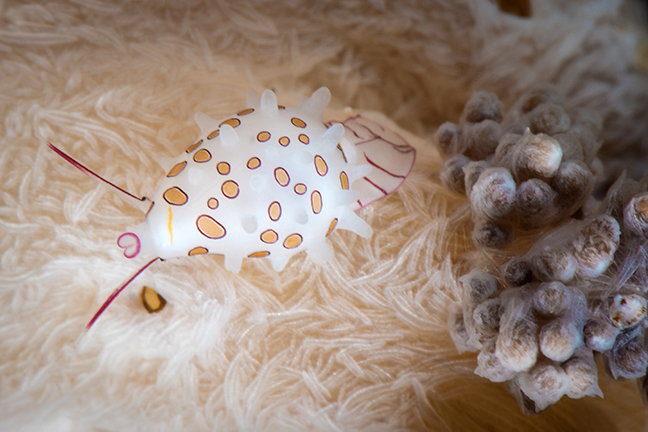 Lembeh Strait is known for its extensive collection of weird and wonderful muck critters, from little known nudibranch species to frogfish galore. 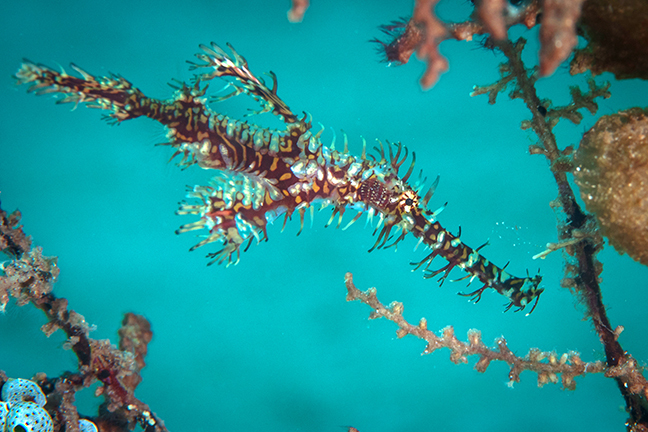 But I had never been diving on the western coast of Sulawesi and was in awe of what I found in Bunaken National Park. An established marine park and reserve since 1991, Bunaken NP covers five islands and the water around them—over 75,000 hectares (346 square miles) in total. Like much of Indonesia, it falls within the Coral Triangle, which is compared to the rainforest of the ocean, containing the most biodiversity of marine life on Earth. Species counts vary widely in the national park, but over 1,500 fish species, 70 coral species, as well as dolphins, pilot whales and even the rare dugong have been documented in the park. And there are likely more species to be recorded, given its location. The deep waters and ample ocean currents around the islands of Bunaken, Siladen, Manado Tua, Mantehang and Nain play a role in the vast amount of marine life in the area as do the varying ecosystems, including seagrass beds, mangroves and tropical waters. 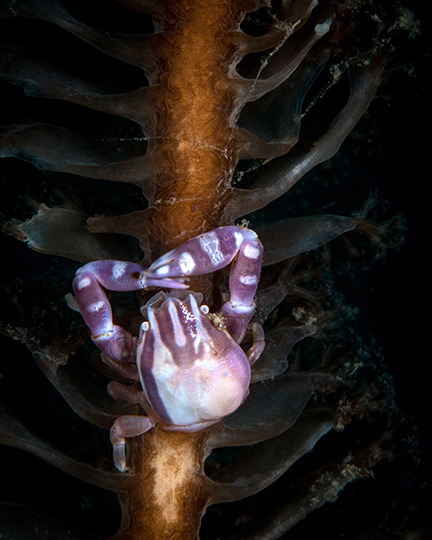 For photographers, Bunaken offers everything one could want and more, but it does test one’s ability to answer the never-ending question of whether to shoot wide-angle or macro. The walls are covered in life, creating many picture-perfect wide-angle opportunities, with healthy corals and sponges, plenty of fish, and of course, sea turtles everywhere. 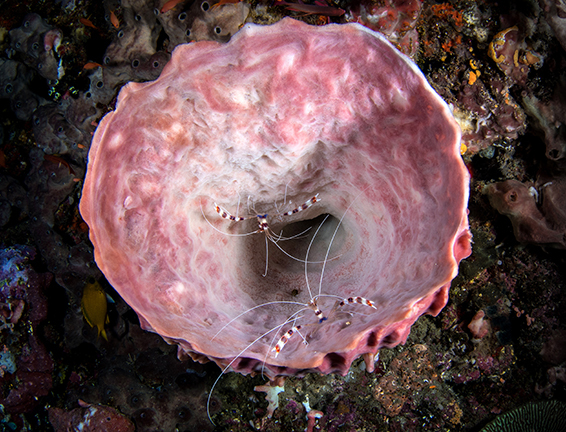 But upon close inspection, the walls are teeming with tiny stuff, including leaf scorpionfish, anemones with anemonefish and clownfish, tiny frogfish, shrimp, crabs and many species of nudibranchs. For those who cannot imagine diving North Sulawesi without going on a black sand treasure hunt for the marvels of muck diving, don’t worry, there is plenty of that too. 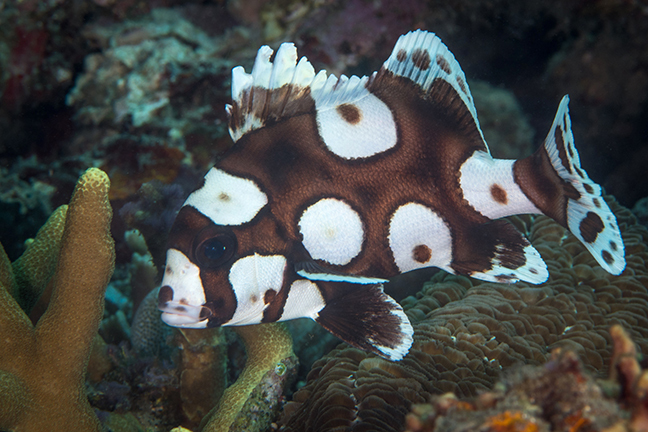 Along the coast of the actively volcanic North Sulawesi, black sand muck diving is abundant. Our first muck dives were around Poopoh, and the underwater landscape was a slowly sloping sandy bottom with small patches of coral. 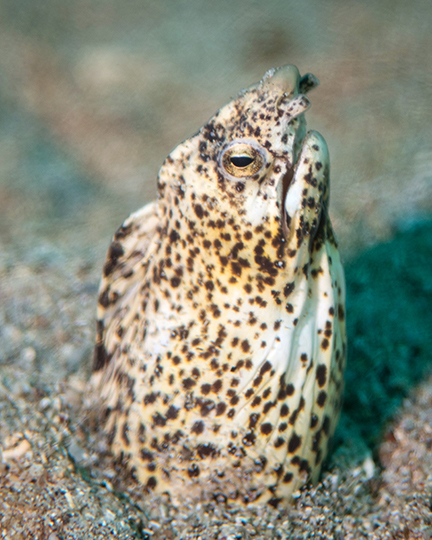 I am always amazed by how fantastic the dive guides are in spotting tiny critters, and it was not long before my dive buddy and I had been shown to a freckled snake eel, several shrimps in bubble coral, and at least five species of nudibranchs. 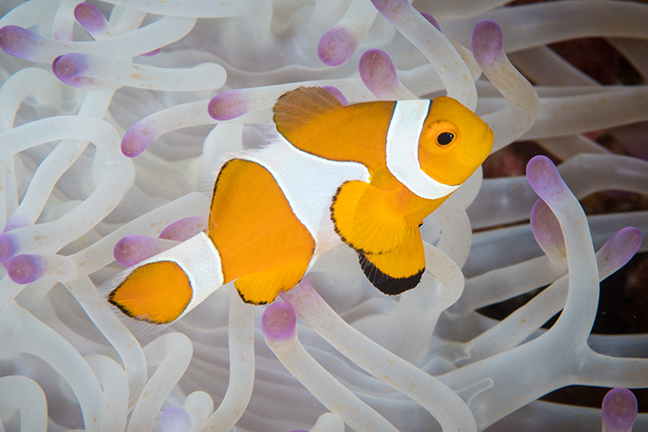 Different colored anemones dotted the underwater landscape with several species of anemonefish and clownfish, as well as crabs and shrimp residents. 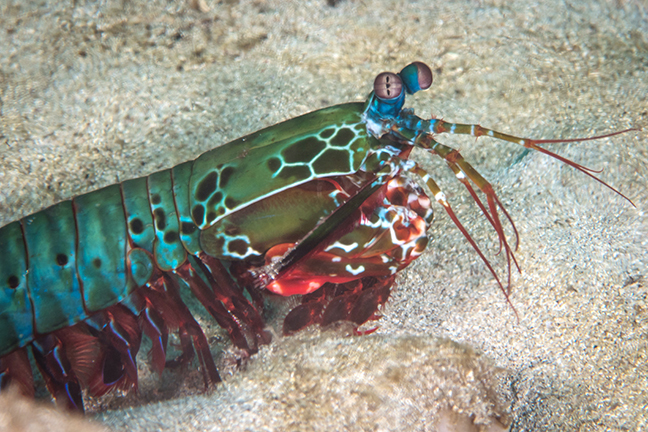 Just before the end of one dive, our guide mimicked he was boxing underwater and then pointed into the coral to show us a brightly colored peacock mantis shrimp fully out of its burrow, walking along on the sand. In the shallows were seagrass beds, and we had heard about the potential to see elusive dugongs, so I tried to keep one eye on the sand, looking for tiny critters and my other out in the water column. 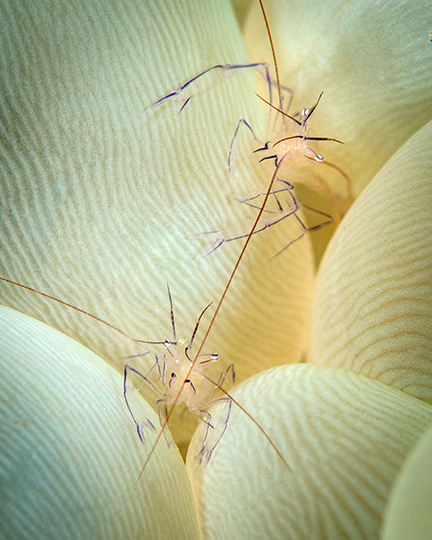 No such luck on the dugong, but who knows, one could have swum right over my head while my attention was fully absorbed in trying to get a photo of a single skeleton shrimp on a hydroid. 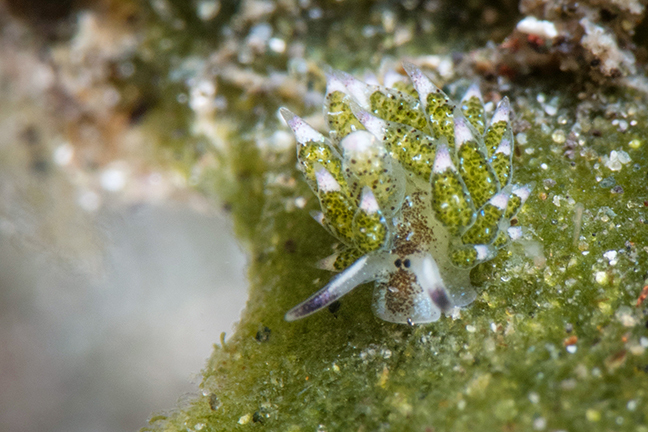 Other muck dives revealed many of my favorite muck critters, including seahorses, several species of ghost pipefish, large and small frogfish of many colors, and even a soft coral cowry the size of a lint ball, thanks again to the amazing eye of the dive guide. 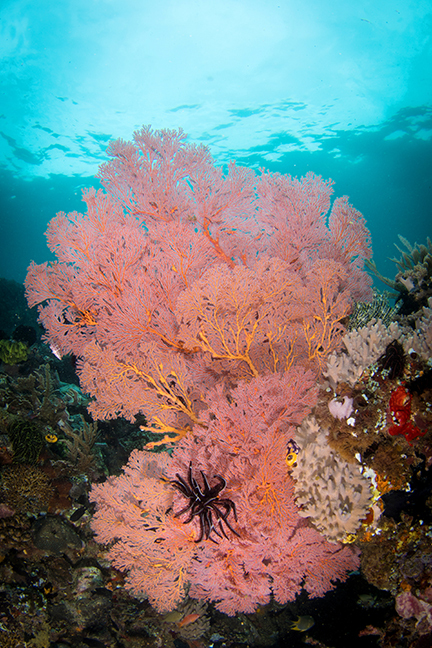 So, what is the best way to see both the stunning corals of Bunaken National Park and the muck diving of Sulawesi? Thalassa Resort is a great place to use as a base to see it all. Located on the main island and only about a 30-minute drive from the airport in Manado, this charming resort is set among stunning landscape, with a very cozy feel about it. The landscaping and greenery around the resort are lovely. 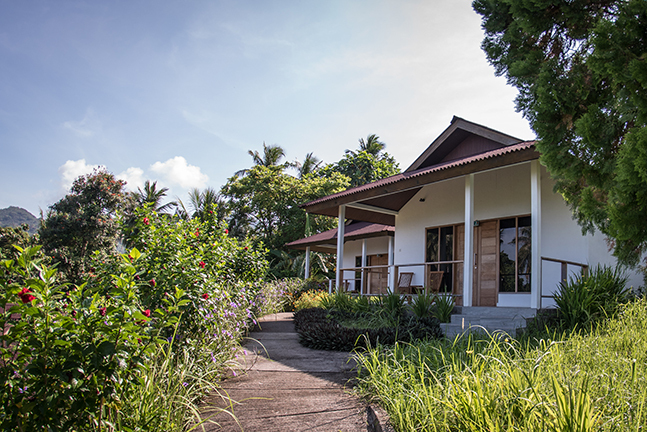 From the moment you enter the property, you notice the extensive amount of plant species, including plenty of brightly colored exotic flowers, and unique trees such as the starfruit tree that was right outside my bungalow. The path that takes you from the restaurant and dive center to the bungalows is so dense in flora that part of the path is a tunnel of vegetation. It was fun to walk through, especially at night when soft lights lit up the pathway, casting a lovely glow on the trees. The bungalows are built on a hill at different levels, all having gorgeous views, some with partial ocean views, that made you feel like you were in the Indonesian jungle. Each morning, I was awakened to the songs of many birds, and each night crickets filled up the airwaves. The ambience of the resort exudes relaxation. There is no hustle and bustle, and stress levels of everyday life seem to melt upon arrival. On several nights, there was live music during dinner and into the evening. 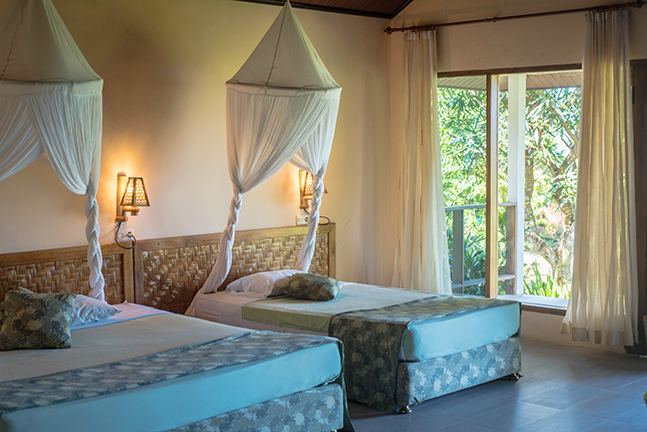 For those wishing to de-stress with a massage, there is a peaceful spa with windows overlooking the mangroves and water. Not to mention, you can take a nice detox from the internet (which we all probably need more than we realize), but if you cannot go without it, it is available in the restaurant for free. Further relaxing can be done at the large pool (a favorite place to watch the sunset). There is also a small shallow pool next to it for the kids and plenty of lounge chairs for sunbathing. The dining area is large and airy, providing a great place to enjoy conversation with other divers. There is coffee and tea available all day, a bar, and (my favorite) an ice-cream cooler with plenty of ice-cream bar options for late-night or after-dive cravings. One night was pizza night, made to order in a wood-fired brick oven and enjoyed out on the terrace surrounding the pool and overlooking the water. Thalassa Resort is a PADI 5-star resort and instructor development dive center. The staff can teach everything from a Discover Scuba dive to Instructor Development classes. In fact, the resort is one of the main places that local Indonesians go to become dive instructors, and then they go on to work at the resort or at others throughout Indonesia. The owner, Simone Gerritsen, is a PADI Course Director, and the dive center has been teaching instructors since 1996. Diving from Thalassa could not be easier. They had flexible dive days, allowing divers to pick and choose from an 8am, 10am and 2pm dive (or all of the above) each day. 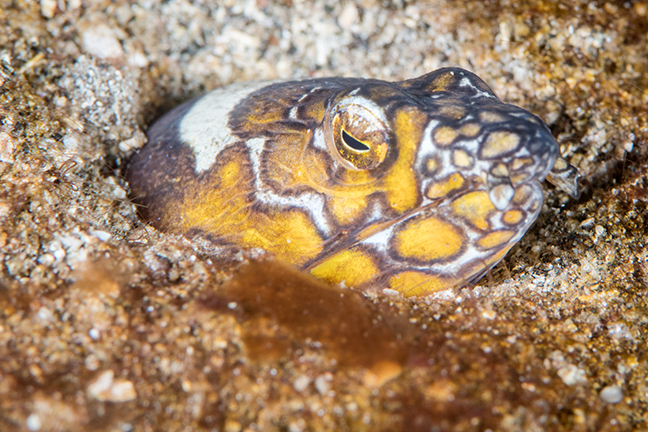 Night and mandarinfish dives were available on request, and divers could enjoy unlimited dives on the house reef. The dive shop had a nice camera room with many electric outlets for charging, and was secured overnight. Dive boats were spacious, and the crew took care of setting up and taking down gear, so all we divers had to do was show up with our cameras, ready to go. Plenty of towels were available on the boat (as well as by the pool), and after the dive, there was hot tea and fruit. 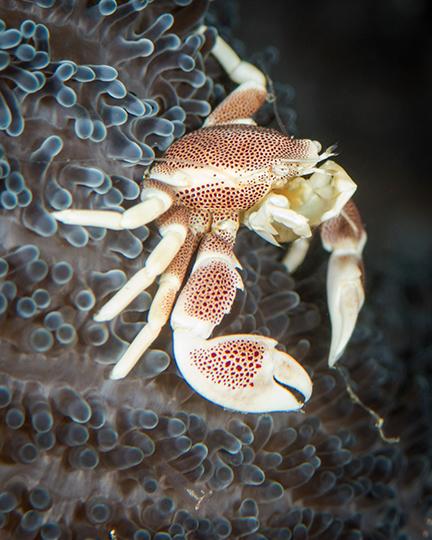 The diving around Bunaken Island is only a 20-minute boat ride from the resort and exceptional muck diving can be found on the mainland very close to the resort, both of which could keep any diver satisfied for many dives. But for those really wanting to get the most out of their trip to North Sulawesi, Thalassa makes it easy to dive all of the famous areas. 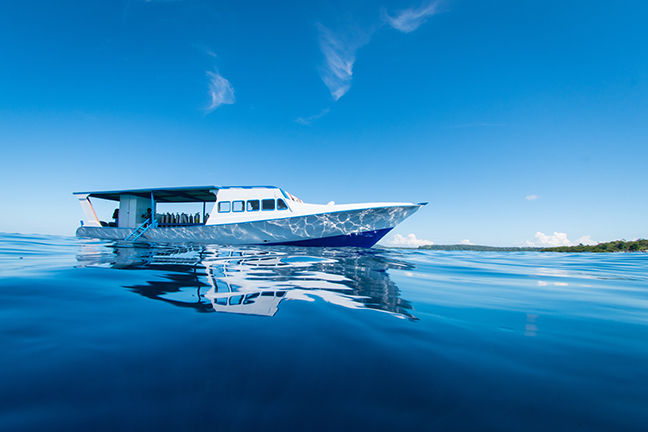 Day trips can be arranged to other popular locations for three-tank dive days, such as to Lembeh Strait via a van ride and then a boat trip. Day trips can also be arranged by boat to dive Bangka Archipelago for three dives, which I did on my last day of diving. The boat ride took around two hours, and it was a beautiful, sunny day. The longer boat ride was enjoyable as it was neat to cruise the coastline of North Sulawesi and see the many small islands around it. At Bangka, our first dive was at a site called Sahaung Point, which had many large boulders covered in soft corals. Visibility was a bit murky, but one could see on a clear day that this site would be amazingly colorful with sea fans, sponges and plenty of fish. 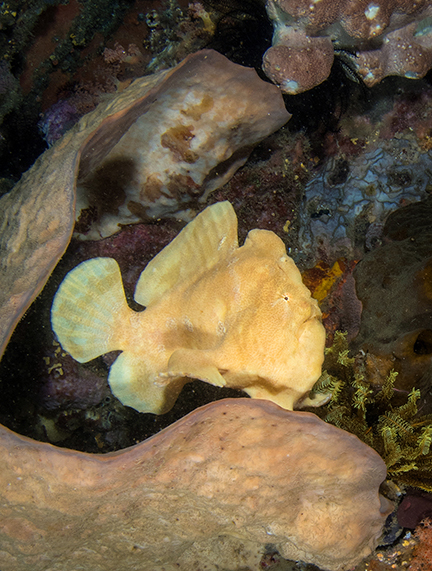 On our second dive, we found three giant frogfish, one of which was yellow and swimming from sponge to sponge. Our last dive of the day was off the mainland (but close to Bangka) at a site called Yellow Coco. It is a place where volcanic activity can be seen underwater. Sulawesi has active volcanoes and our dive guide took us to an area around 20m (65ft) where hot water was coming up from below (which felt wonderful). The hot water venting into the cold made looking through the water blurry. Not much life was around the vent, but it was very neat to experience, and the sand around the water vent was also hot to the touch. Whether diving close to the resort or at more far-off dive sites, the crew went out of their way to make sure guests got to dive where they wanted. On more distant dive trips, lunch was provided on board, and when the boat stayed closer to home, they would return to the resort so we could have lunch, take a quick nap and then, if desired, go back out for the third dive. Diving with Thalassa Resort made it so easy to make the most out of a dive trip, while also relaxing and fully enjoying a dive vacation. 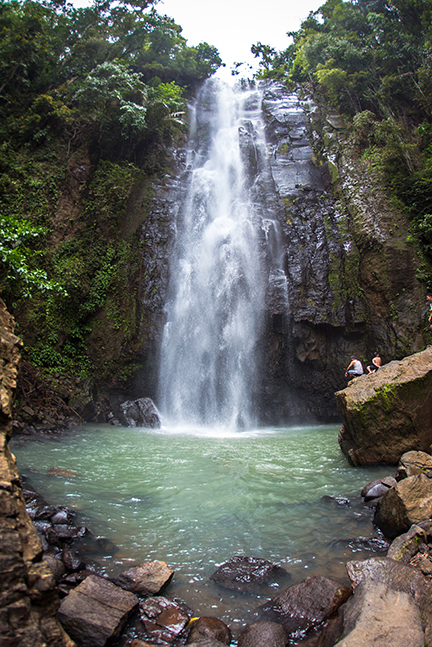 A 90-minute drive east from Thalassa takes you to Tangkoko National Park, a reserve that has been a conservation area since 1919. 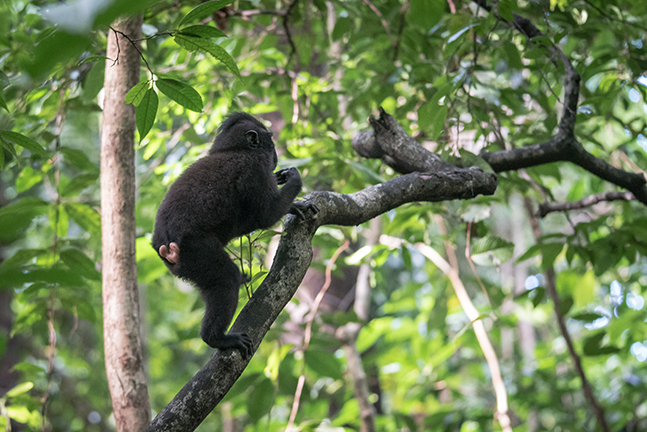 Famous for the possibility of seeing tarsiers, the world’s smallest primate, visitors also commonly see black crested macaques and bear cuscuses. The park has documented 127 mammal species, 233 birds, and 104 reptile and amphibians, many of which are endemic to the island. We set out to visit the park on our last full day (we could not dive because of morning flights), which made it fit perfectly into our schedule. Once at the park, a local guide and park ranger led us on our hike in hopes of viewing the big three: macaque, cuscus and tarsier. After just minutes on the path, we spotted wild pigs and our guide stopped, alerting us to the different bird calls and identifying what species they were. I had visited the park several years ago and remembered getting to see all three with very little effort. I had not realized how lucky I was at the time, until this visit; we had been hiking for over two hours through mud, spider webs and battling biting ants before even getting a glimpse of a monkey. Then, suddenly, we were surrounded by macaques. A mother carrying its baby on her back crossed the path just in front of us, and we spotted a young monkey jumping from tree to tree over our heads. The largest male (likely the alpha) sat in the middle and just looked at us while munching on some leaves. Our discomfort over the long hike was forgotten the instant we saw the monkeys and our cameras were out, snapping away. After a little while, we left the macaques in peace and continued to hike. Next up in our search was the cuscus. 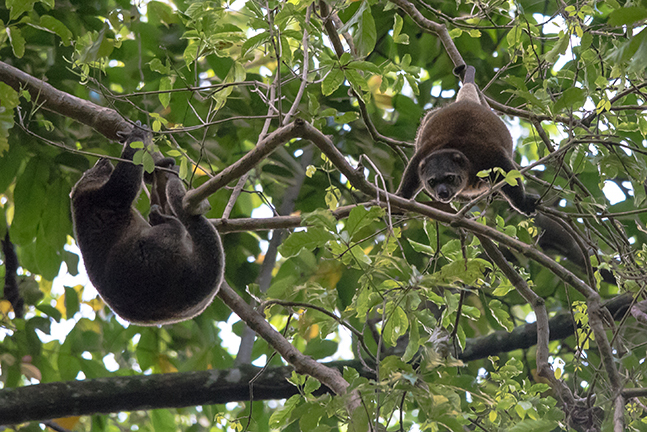 Cuscus (sometimes spelled "kuskus" or called Sulawesi bears) are not actually bears, but arboreal marsupials endemic to Sulawesi and a few nearby islands. They have long, curled claws and prehensile tails that allow them to climb considerable heights to the tops of the trees where they live and eat leaves and flowers. Our guide stopped us, his gaze directed to the tops of the trees. “Do you see that black dot in the tree?” We looked, and looked some more. I took out my telephoto lens and aimed for the spot he described. Snapping a photo and then zooming in on the photo, there it was, an adorable cuscus looking down at us. Last up was the tarsier. Said to have inspired the design of the gremlins and some even say was the inspiration for Yoda in Star Wars, these large-eyed, large-eared, large-fingered, but tiny monkeys seem to be so ugly that they are cute. 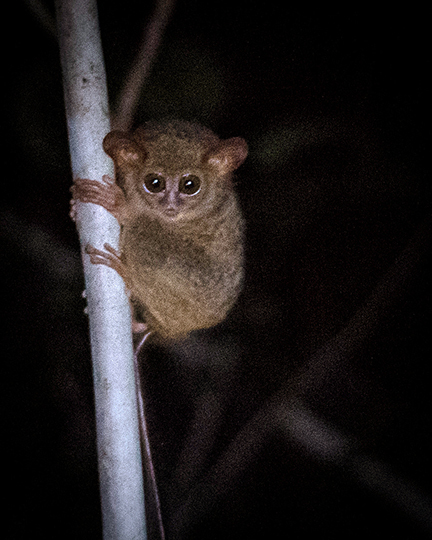 Tarsiers are nocturnal, so we had to wait until just before sunset before we might get a glimpse. Our guide led us to the tree in which the tarsiers are usually found, and we waited. And waited. The sun had set and the sky had turned a blood orange, giving us a warning that it would be dark soon. We had to start hiking out so we would not be walking too long in the dark. Two out of three isn’t so bad, I was thinking, as we tried not to trip over tree roots or hit our heads on low branches in the dark. Then, off in the distance, we saw a light signaling us. (It was like we were on a night dive and someone was flashing their light to us to say they had found something good.) Another guide and his group had found a single tarsier on a tree while they were hiking out. We stopped for a few minutes for a glimpse of these amazingly strange animals that are genetically our not-so-distant cousins. It was no larger than a person’s hand and seemed to be all eyes and ears. With the biting ants returning and mosquitoes swarming, we were satisfied with the brief encounter and continued our way out of the jungle, feeling quite lucky to have seen all three amazing animals of which we had hoped to catch a glimpse. Special thanks to Thalassa Manado Resort (Thalassamanado.com).